The most important asset at a company is not something you can put your hands on. It is not the equipment or the data or even the intellectual property, but the people — the human capital — what can either make or break a business. Which is why most companies spend so much money trying to support the health and wellbeing of their employees. Sitting down for long periods of time is one of the main problems people face when working in an office. The way most companies try to tackle this problem is by buying sit-stand workstations for them. But are height adjustable tables really the answer? 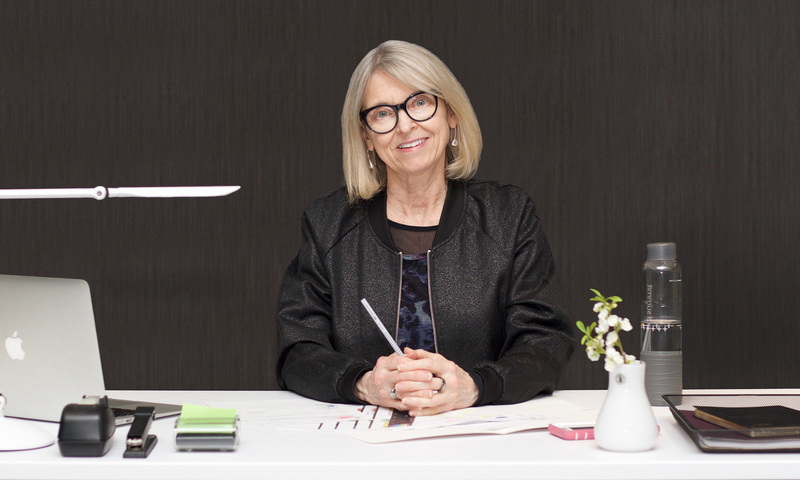 We asked our Certified Ergonomist, Lucy Hart, what she thinks of the tables, the best way to use them and the common mistakes employees make when they first get them. 1. In your professional opinion, do you believe sit-stand tables are the answer to the sitting-too-much problem office workers face? The issue is not sitting for too long but that people are not moving enough. 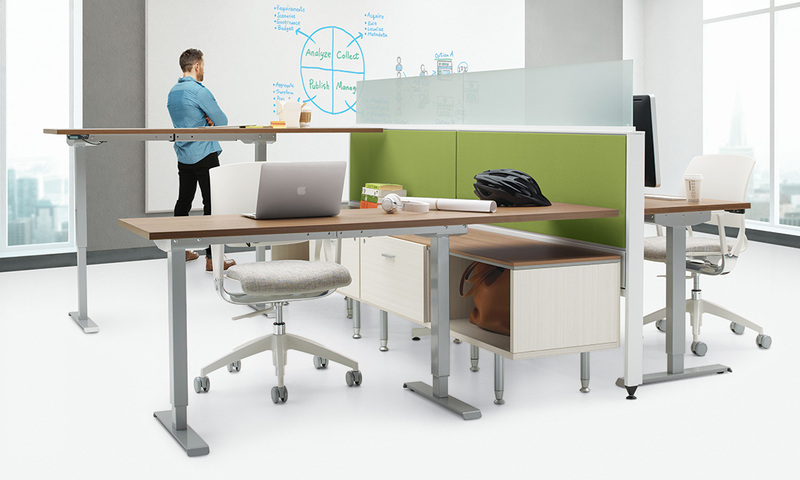 What the sit-stand workstation does is give people an opportunity to not sit all day long. Furniture is an inanimate object. Getting a new desk doesn't guarantee anything. This is why education is so important. Corporations need to invest in some knowledge that they can later apply to invest in products that are going to give them the return on their investment. 2. What is the biggest mistake companies make when buying sit-stand workstation for their employees? Not educating them on how to use these workstations. There’s a study done by Liberty Mutual [insurance company] that showed that when they trained employees how to use the tables properly and educated them on the importance of moving and what it means to the health of the body, they actually used them, increasing their performance and productivity. But when they provided minimal training, most people didn't use the table. 3. So what is the right way to use sit-stand tables? When you have a sit-stand workstation you should be changing your posture roughly every 20 minutes. Use it to go from sitting to standing and back down. Some people may like to stand for half a day and sit for the other half. That’s wrong. Both sitting and standing for long periods of time is bad for your health. 4. Is exercising during the week enough to counteract the time someone spends sitting all day? Absolutely not. People that go to the gym 5 times a week think they don’t need to stand throughout the day but studies have shown that those little spurts of activity, even though they may go for an hour, are not enough. We need continuous motion for the health of our bodies. 5. 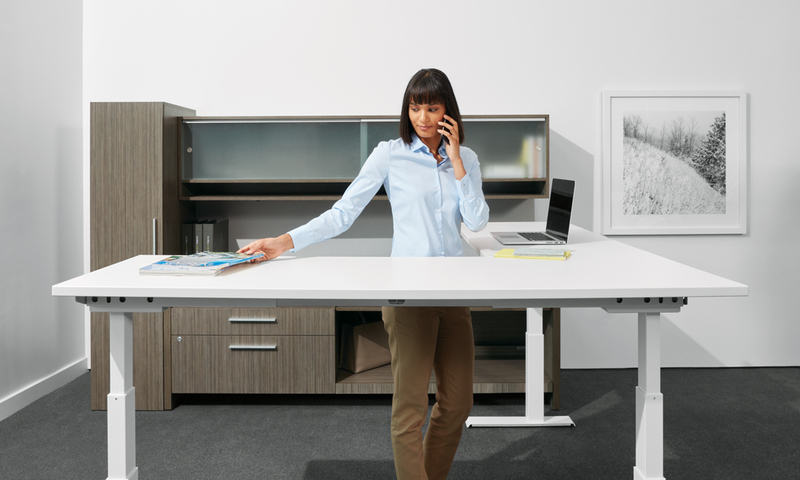 Are these sit-stand workstations the only way companies have to increase mobility in the workspace? It’s not the only way. 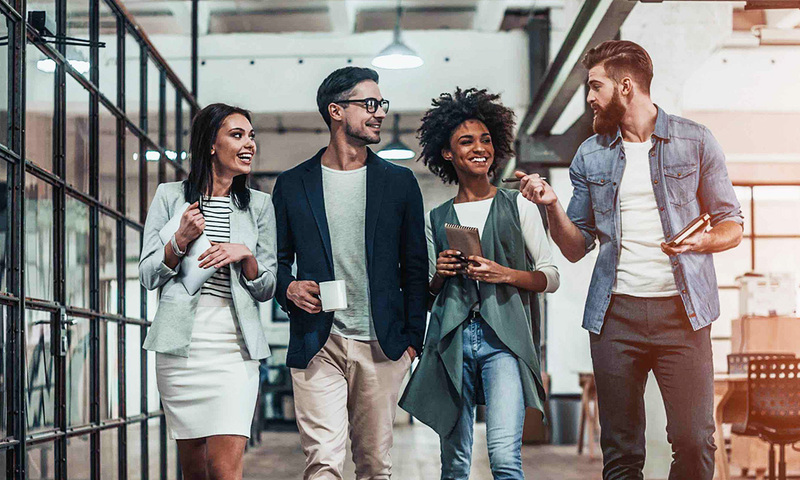 There are other ways to increase activity levels in the workplace like standing and walking meetings. In fact, there are some companies that block the floor people work at, so if someone works on the 16th floor, they block that floor on their pass so they can only get off at the 14th or the 18th, which means they have to take the stairs to ultimately get to their floor. 6. What would you recommend to a company opening new offices interested in including sit-stand desks for their employees? I would say commit to educating your employees and buy one for anybody whose job is largely in one location and working on a computer. So, whatever percent of their population that is. 7. What are some other benefits that come from buying these type of workstations? They can reduce the footprint compared to other workstations. If an employee works mostly with their computer and little else, a sit-stand workstation takes up less space than an L-shaped workstation. Real estate costs a lot of money. Intelli Beam shown here with height adjustable tables. 8. What is another common mistake companies make when buying these sit-stand tables? They don't realize that not all sit-stand tables are created equal. A given model may not meet the needs of all users. For example, if they are buying sit-stand tables for a group of people that is predominantly women then they are going to need tables with a lower height range. If it’s a mix of men and women they may need a larger height range that starts lower and ends higher. Most companies just like buying the least expensive tables and those may not fit their employees’ needs. 9. What is a common reason people get discouraged from using their sit-stand tables? The speed. Sometimes, the time it takes to go from the low height to the standing height can discourage people from using them. 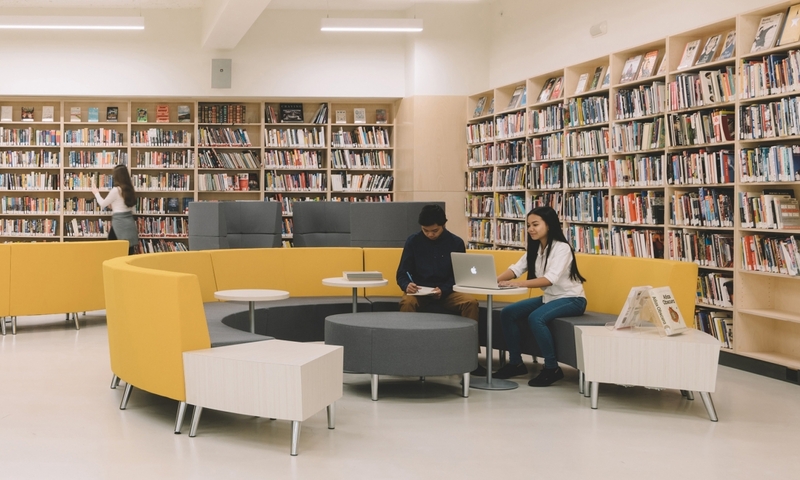 The least expensive tables tend to be slower and also noisier, which may make people feel self-conscious about disrupting others with the noise. Lucy Hart MSc, CCPE is the Certified Ergonomist for Global Furniture Group. She is a Canadian Certified Professional Ergonomist, Member of the Association of Canadian Ergonomists, Human Factors and Ergonomics Society and Past-President of the Board of the Canadian College for the Certification of Professional Ergonomists. Lucy is also the Chair of the Canadian Standards Association Z412 Office Ergonomics Technical Committee, Chair of the Business and Institutional Furniture Manufacturer’s Association Ergonomics Subcommittee and a peer-elected Educationally Influential Ergonomist as recognized by the Institute for Work and Health.